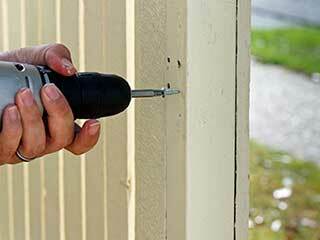 If you're in need of prompt, reliable, and honest gate repair services, contact our local experts today. Our technicians are trained to provide services and resolve all types of garage door and gate problems. Our company understands the importance of a properly functioning gate to keep your home or business safe and secure from unauthorized access. We're here to help ensure your gate remains operational round the clock. We offer a wide array of quality repair services when it comes to gates. Whether it's an automatic opener malfunction, a programming issue or you're simply in need of a replacement, our technicians can help. You can trust our technicians to figure out the root of any problem and ensure it gets fixed for good there and then. We are experts when it comes to designing and installing entry systems. We work well with architects and builders to ensure that your vision gets turned into reality. Further, all our installation services are carried out according to industry safety standards - we'll ensure everything is working safely before completing a job. We can repair any problem with your unit and replace any faulty parts after completing a full diagnostic test on your system. We understand the importance of an operational unit and it’s our priority to confirm that any repair or replacement part that's installed is designed to continue working smoothly into the future. When it comes to part replacement, our technicians usually have spare components ready and waiting so you're unlikely to have to wait long if you're in need of a basic swap. We understand the importance of rapid assistance when it's an emergency - that's why we offer same day services. If your automatic gate has simply stopped responding and you're in need of help quickly, just let us know it's urgent when you call and we'll do our best to get to you as soon as we can. Further questions regarding our services for automatic gates? Just get in touch with our team today at Garage Door Repair Santee - our experts will be happy to discuss any issues you're experiencing.